W.H. Stevenson, ed., Blake: The Complete Poems, 3rd ed. Helen Patricia Bruder has followed and contributed to debates about Blake and gender since the early 1990s. She and Tristanne Connolly hope their collection Queer Blake (Palgrave, forthcoming) and conference Blake, Gender and Sexuality in the Twenty-First Century (London, summer 2010) will take these vital discussions further still. Martin Butlin, former Keeper of the Historic British Collection at the Tate Gallery and author of the standard catalogue of Blake’s paintings and drawings, is at present involved in the Blake Trust publication of Blake’s illustrations to Blair’s The Grave. Robin Hamlyn became the William Blake specialist at the Tate Gallery when Martin Butlin retired in 1989. 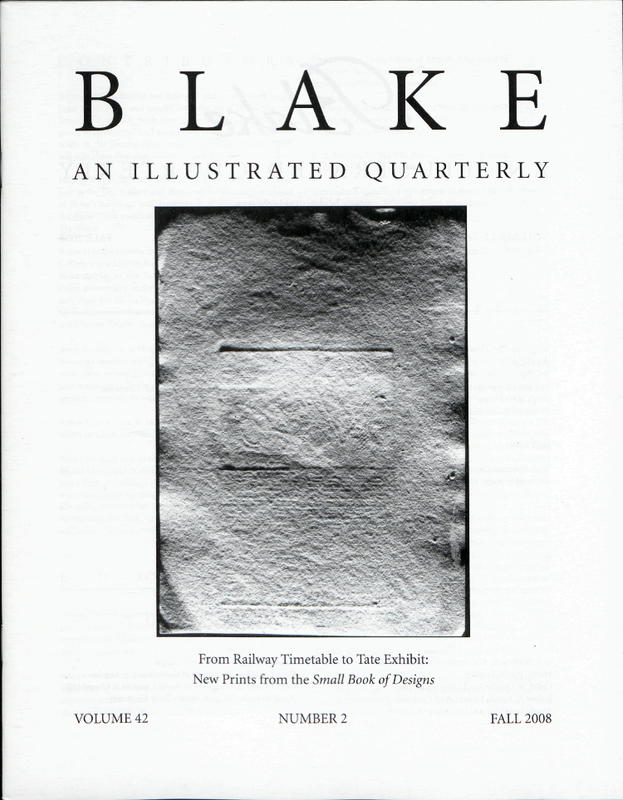 His most recent Blake display at the Tate, in 2007-08, commemorated the 250th anniversary of the artist’s birth; he wrote the introductory essay for the facsimile edition of Poetical Sketches (copy Q) that accompanied the exhibition. His commentary on Edward Young’s Night Thoughts appeared in 2005. Justin Van Kleeck is an independent scholar and freelance writer in Charlottesville, Virginia. Angus Whitehead is an assistant professor at Nanyang Technological University, National Institute of Education, Singapore, and editor of the Blake Journal. He is currently working on a microbiography focusing on William and Catherine Blake’s last years, derived from fresh archival research. His essay “Rehabilitating the ‘Bad’ Ancient: The Life and Times of Frederick Tatham” is forthcoming in Visual Culture in Britain. Cover: Verso of The First Book of Urizen pl. 19, color printed and hand colored by Blake for the second copy (B) of Small Book of Designs, 1796, finished c. 1818. Private collection. Photo courtesy of Tate.